The Yankees built off last night’s win by dominating the Red Sox throughout the game to a 10-1 win on Wednesday Night Baseball on ESPN. Luis Severino outmatched lefty David Price, as the Yanks offense, unsurprisingly led by Luke Voit, continued its dominance on Price. Heading in, this was a massive start against the league’s best team for Luis Severino to try and get back on track to his ace-like self as he’s been a below-average starter for months now. Through four innings, he went without any damage and didn’t have much of a threat other than the first inning when he worked out of a second and third, one-out jam. In the fifth, Sandy Leon broke his historically bad streak of being hitless in his previous 30 ABs, following up an Eduardo Nunez double with an RBI single. This would happen to be the only blemish for Severino though, as he lasted seven strong innings. He gave up six hits, walked just one, and struck out six. It was Severino’s second consecutive start of allowing just one run and he’s looked good over his last six starts other than a rough outing against the A’s two weeks ago. 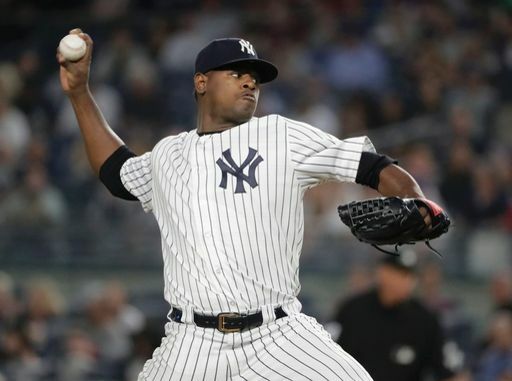 The signs continue to be encouraging and hopefully it’s the start of a resurgence from Severino. As for the relief work, Jonathan Holder came on for the eighth inning and gave up one hit and zero runs while striking out one. Top prospect Justus Sheffield made his MLB debut in the ninth inning and the youngster struggled a bit. He allowed a leadoff single to Brock Holt and then allowed an infield single to Nunez on the next AB as he struggled to get the ball out of his glove on the slow groundball. Sheffield bounced back by getting Leon to pop out, but then walked Jackie Bradley Jr. to load the bases for AL MVP frontrunner Mookie Betts. Betts nearly hit a grand-slam off Sheffield, but it hooked just foul. A few pitches later, Sheffield got Betts to ground into a game-ending double play. The offense shone in this one, as they got to face David Price, who’s notoriously bad in his career against the Yanks. They took advantage of the short porch in right field, as Luke Voit and Miguel Andujar both hit opposite-field homers that just cleared the fence early on. With bases loaded and two outs in the third, Aaron Judge, still searching for his first hit at the time since coming off the DL, hit a grounder that the third baseman Nunez couldn’t handle, and two runs came around to score. Judge did end up getting his first hit in the sixth inning, an opposite-field single to right field off Joe Kelly. 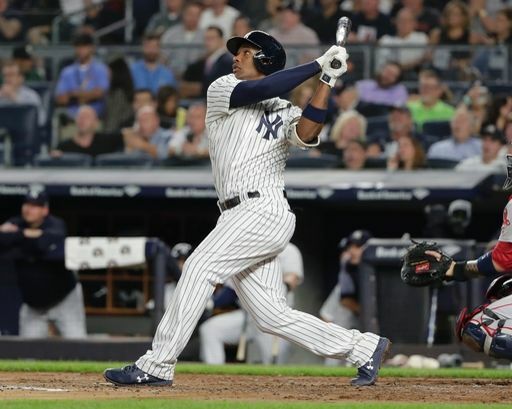 The Yankees tacked on four more runs in the sixth which included another wall-scraping home run from Voit off Price, knocking in two, and then a two-run triple from Aaron Hicks off Kelly. Voit went four-for-four on the night with two singles, three runs scored, two homers, and three RBIs. Two more runs came across for the Yanks in the eighth on an RBI groundout from Greg Bird and an RBI single from Aaron Hicks, whom ended the night with three RBIs. The Yanks look for the three-game series sweep tomorrow night against the Red Sox, as Masahiro Tanaka (12-5, 3.47 ERA) looks to continue his recent dominance against Eduardo Rodriguez (12-4, 3.53 ERA).